To ask other readers questions about Age of Opportunity, please sign up. Right now my children are 13, 15, 17, and 19. Invariably when that comes up during an introduction, I get a knowing look, perhaps an expression of sympathy, or at least a patronizing assurance that I’ll survive. But I have found myself rather enjoying these teenage years. Not because they are trouble-free, but in fact because they are so incredibly challenging! I have been stretched like never before and forced to rely on the grace of God in unexpected and undesirable situations. Pleas for wisdo Right now my children are 13, 15, 17, and 19. Invariably when that comes up during an introduction, I get a knowing look, perhaps an expression of sympathy, or at least a patronizing assurance that I’ll survive. But I have found myself rather enjoying these teenage years. Not because they are trouble-free, but in fact because they are so incredibly challenging! I have been stretched like never before and forced to rely on the grace of God in unexpected and undesirable situations. Pleas for wisdom are daily on my lips, and my prayer life has grown exponentially. My teenagers are four of the greatest blessings in my life. As I read this highly relevant book by Paul Tripp, one emotion constantly surfaced in my heart: inspiration. I love the vision he cast for not merely surviving the inevitable teen years with our children, but instead viewing them with excitement and brimming with opportunity. He doesn’t give teens an easy pass, capitulating to the cultural norms of rebellion, moodiness, and self-centered living. Rather, as image-bearers of an incredible God, he holds them to a high standard of learning to know and seek God for themselves. As a parent, I was inspired to honestly deal with the idols and sins in my own heart and to make the most of every interaction with each one of my teens to draw them out with questions and gently lead them to discover eternal truths that they can apply to whatever situation they are facing. The teenage years are an age of opportunity to prepare one’s teen for a wise, God-honoring, God-fearing life driven by biblical conviction rather than worldly culture. It is an age during which parents plant seeds that will (hopefully) result in maturing young adults who love the Lord and His Word. Many parents, however, self-centeredly view the teenage years as a struggle for survival! This is an unbiblical mindset. It is true that teenagers are in a unique season in their life, in which they battle unique temptations. But teens are no different than their parents or anyone else: they are sinners, engaged in a spiritual battle, in need of a Savior. Best book I've read in years. Should be required reading for any parent of teens or even younger children. Revolutionary--if more parents applied the principles from this book (which are rooted in the Bible) to their relationships with their teens, we would start to see genuine change in our society. If you are a parent to teens (or soon will be) or you work with teens, this books is essential reading. Paul David Tripp works through some of the difficulties of working with, communicating with, and raising teenagers. The bulk of the book deals with setting biblical goals for teens and strategies to achieve those goals in parenting. The goals are high and founded on the Bible but the book is so realistic about the sinfulness of the human heart and the true nature of biblical change, that the g If you are a parent to teens (or soon will be) or you work with teens, this books is essential reading. Paul David Tripp works through some of the difficulties of working with, communicating with, and raising teenagers. The bulk of the book deals with setting biblical goals for teens and strategies to achieve those goals in parenting. The goals are high and founded on the Bible but the book is so realistic about the sinfulness of the human heart and the true nature of biblical change, that the goals don't seem impossible. Another strength of the book is the chapter dealing with culture. Most Christian families move toward isolation or assimilation and Tripp attempts to cut a third path for us. His thinking on teenagers, the family, and culture was very, very good. One of the things I always love about Paul Tripp's books is that he shares examples from his own life in which, more often than not, *he* is the bad guy. He shares his own failures as a parent and focuses on his own need to repent as much as he focuses on the changes he wants to see in his teenagers. Because ultimately this book is about relationships and that's why, despite not having any teenage children of my own yet, I felt convicted again and again while reading this and noting my own sinful behavior in relationships. This book was fantastic for making me think. It is really great for any parent, with young or old children. And it is more about my own sin-nature and how my approach can be grace-filled, guided by the Word. I am re-reading after 2 years because my oldest is almost 12 and he is definitely hit the pre-teen phase now! This book is a MUST read for anyone who is setting out to raise teenagers or who even volunteers or works alongside teens. This book forces the reader to examine his or her own heart and gives the best biblical foundation for parenting that I have ever heard or read. It is a long book but well worth the read of every page. Great book. I mean, yes, I am a fan of the Tripp brothers so pretty much anything they write I like. But Paul Tripp's wisdom (and his brother Tedd) is so down-to-earth and biblical. It just makes sense on all sorts of levels. So since the hub and I already a few years into the teens with our redheads I probably should have read this book a few years back but it is what it is and I certainly don't regret that and don't feel like it is "too late" now to implement any changes my heart picked up on Great book. I mean, yes, I am a fan of the Tripp brothers so pretty much anything they write I like. But Paul Tripp's wisdom (and his brother Tedd) is so down-to-earth and biblical. It just makes sense on all sorts of levels. So since the hub and I already a few years into the teens with our redheads I probably should have read this book a few years back but it is what it is and I certainly don't regret that and don't feel like it is "too late" now to implement any changes my heart picked up on while reading this book. Fortunately we both have a great relationship with our teens and they won't see us as hypocritical or inconsistent should we make some changes. Tripp's book seems, at first read, like a lofty and unrealistic way to parent. As he aptly points out in the book, we have a hard time seeing how to get from where we are to where we want to be. But his counsel is not lofty nor unrealistic and if you have read Shepherding a Child's Heart by Tedd Tripp then chances are good that you are already parenting your teen in some biblical ways. This book is a great follow-up to that book by the other Tripp. Even without reading that book this Tripp's parenting counsel is still not lofty nor unrealistic because it is biblical and God's instructions are never lofty or unrealistic, we make them so because they rub against our flesh or they go against the flow of culture but they are not. The counsel in this book is excellent, as a parent of two teens I appreciated the reminders, the exhortations, the new counsel I had never considered. I appreciated the encouragement that it is never too late to make changes in my parenting style. I appreciated Tripp's reminders of our teens and what kind of spiritual battles they are up against in today's culture. I was glad for his reminders, consistently, that we are also in need of the same attitude adjustments as perhaps or teens are - they we, as parents, are not exempt from needing a heart change and that it actually must come through us first. In the first few pages of the book Tripp makes a statement that sums up the book's purpose well. "....we need to see our teenagers with the eyes of opportunity rather than eyes of dread and fear." (page 22) And the book is dedicated to showing parents how to make the most of the teen years and doing our job of raising up teens who love Jesus, want to serve and follow him, and work ourselves out of a job because our teens have become mature and responsible adults. I thought this book had good things to say about raising teenagers/children. I didn't think it was anything revolutionary or that I hadn't already read or thought about. I think that if you come from a background of attachment parenting/emotional coaching with your children - this will be old hat by now. You have hopefully already built a relationship with your children that will stretch into the teen years. I strongly disagree with his brothers book - "Shepherding A Child's Heart" - and I read t I thought this book had good things to say about raising teenagers/children. I didn't think it was anything revolutionary or that I hadn't already read or thought about. I think that if you come from a background of attachment parenting/emotional coaching with your children - this will be old hat by now. You have hopefully already built a relationship with your children that will stretch into the teen years. I strongly disagree with his brothers book - "Shepherding A Child's Heart" - and I read this one because he is going to be at a homeschool gathering this summer that I was thinking of attending. I could not, in good conscience, support the gathering if his brothers violent methods of child "training" were going to be the focal point of the event. After reading this, I believe he is well intentioned and has great advice about parenting a teenager. No violent advice here - only common sense about listening to your child and parenting unselfishly. This book is as much about parenting teens as it is learning how to shepherd our own hearts as parents. In this book, Tripp consistently gets to our heart conditions and attitudes with helpful illustrations and stories from his own family and pastoral experience. The gospel is always the solution and the goal of parenting is to persuade, plead, and instill in your teens a heart for God. This book helps a parent really think through what is truly important in raising your children into adulthood s This book is as much about parenting teens as it is learning how to shepherd our own hearts as parents. In this book, Tripp consistently gets to our heart conditions and attitudes with helpful illustrations and stories from his own family and pastoral experience. The gospel is always the solution and the goal of parenting is to persuade, plead, and instill in your teens a heart for God. This book helps a parent really think through what is truly important in raising your children into adulthood so that you do not miss this golden opportunity to shepherd and guide your teens into a healthy and godly relationship with Christ. This book is thoroughly biblical and very practical for helping you think through the bible's teaching on parenting teens before you have teenage children. It is easy to read and has a great balance between correcting a parent's wrong expectations with giving them so much hope and encouragement in Christ. This is a must read for any Christian parent. I would strongly recommend reading this and thinking through biblical parenting of teens well before your children become teenagers. The concepts, ideas, principles, and strategies in this book are worth at least 4 stars. However, Tripp seems to want to take three paragraphs to say what should be said in one paragraph. While the content is exceptional and worth reading, you will actually read it several times while reading the one book due to his repetition. Great content, great examples, and I found it very useful and convicting. Just wish he had written it in 175 pages instead of 250. Though this book is aimed at parents of teens, it has been super helpful for me as both an elementary teacher and a youth group leader. It is a bit repetitive and less practical than I prefer, but Tripp presents a beautiful and biblically sound vision for the teenage years that really has a lot of application for redemptive living in general. Definitely worth the read, especially if you hold a place of significant influence in the life of kids. 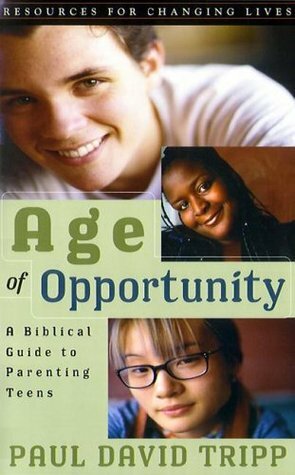 Tripp's Age of Opportunity is an exposition of parenting from a strictly biblical perspective. For that reason, it is tremendously helpful. Tripp does an excellent job of connecting the dots between biblical exegesis and parental application. He highlights the task of parenting, the sinfulness of children, and the responsibility of showing grace in discipline (without minimizing the need for grace). This book will be at the top of my list for suggested reading for parents. Unquestionably the best contemporary book I have read yet on parenting teens! Tripp takes a very positive slant and helps the reader look at this often dreaded period of life as the most exciting yet! I have read and reread this book with each of our 4 children! So yes, I would recommend it for sure! Excellent guide to parenting teens, with a focusing on reaching their hearts and practical strategies to do so. I am swimming against the tide when I say that I am not overly impressed with Paul Tripp's writings. Nevertheless, I appreciate his honesty in all of his books and his ability to spot the issue beneath the issue. He exhorts his readers in this book to be parents who are aware of the different pressures that a teenager will face and to know how to respond to those pressures when the time comes. Outstanding book. I listened to the audiobook and liked it so much that I bought the paperback so I can go back through it and underline and chew on its truths (and so my wife can read it - she doesn't like audiobooks!). What I appreciate about Tripp’s book is that he focuses first, not on the teenager, but on the parents. On our fear- seeing the teen years as an incredible opportunity to talk about real issues for the first time. On our idolatry- comfort, ease, wanting to appear as perfect pare Outstanding book. I listened to the audiobook and liked it so much that I bought the paperback so I can go back through it and underline and chew on its truths (and so my wife can read it - she doesn't like audiobooks!). What I appreciate about Tripp’s book is that he focuses first, not on the teenager, but on the parents. On our fear- seeing the teen years as an incredible opportunity to talk about real issues for the first time. On our idolatry- comfort, ease, wanting to appear as perfect parents. "Deal with yourself before you deal with your teenager"
"It’s a waste of time to talk about our strategies for parenting our teens if we don’t first look at what controls our heart. We will just see the teen years as a series of irritating inconveniences brought on by a selfish teen. Who make even the most unimportant moments of our life chaotic. Where God has called us to love and serve and correct, we’re barely able to be nice." Pretty much sums up parenting a teen! One great insight: If you look at parenting as a: "I serve, you’re thankful" contract you will deal w a lot of anger/bitterness during the teen years. Again - perfectly sums up my experience in (sometimes bitterly!) serving teens. Fair warning: the audiobook is bad. I listen to a LOT of audiobooks and its the worst audiobook I've listened to: frequent shuffling of pages, monotone narration by the author, repeated sentences, mis-spoken words. And it's only available through the author's website and downloadable as separate MP3's. A mess - had to listen to it on the Soundcloud app. Brilliant book with a strong biblical framework for parenting teens by grace. 'Work in us, Lord, so that you may work through us to capture the liv Brilliant book with a strong biblical framework for parenting teens by grace. Very helpful book. However, I felt like Tripp said the same things over and over. This info could probably be paired down into 1/4 the space. Key points: don't look at "problems" with your teen as inconveniences. Instead see them as opportunities given by God for you to engage your child. During these opportunities, you discuss (not lecture) problems, choices, responses in ways that bring biblical truth to light. Also remember that you are a sinner and you should not be surprised when your teen Very helpful book. However, I felt like Tripp said the same things over and over. This info could probably be paired down into 1/4 the space. Key points: don't look at "problems" with your teen as inconveniences. Instead see them as opportunities given by God for you to engage your child. During these opportunities, you discuss (not lecture) problems, choices, responses in ways that bring biblical truth to light. Also remember that you are a sinner and you should not be surprised when your teen is tempted to sin or succumbs to sin. I will refer to this book until my children are grown. My favorite parenting book of all time. I learned that when disobedience happens, it is an opportunity to guide out children and show them that we are sinners too. Many examples are given in this book that let me know how normal my teenager is. (that is good to know) Gentle reminders of how to parent a teenager. (so different than the elementary and toddler years. if you are a parent read it, you will be I will refer to this book until my children are grown. My favorite parenting book of all time. if you are a parent read it, you will be blessed!! As always Tripp is really helpful in dealing with the human heart. The teenage years are years of great confusion mingled with the pursuit of the answer to the question "Who am I?" This can be a difficult period of life to navigate as a parent of a teen. Tripp gives great sound wisdom in this work. Much of what he suggests we have done in our home for years and we have seen great fruit from it, and are praying for continued fruit. Very practical book on parenting teenager - shift the view of parenting teenagers from a perspective that invokes fears, hesitancy, with a survival mindset to one that views the teenage years as an age of opportunity to shape teenagers with gospel truth through redemptive parenting. I personally don't have children, but his book helps examines not only the heart of teenagers but that of parents and individuals as well. Highly recommended! Paul was born in Toledo, Ohio to Bob and Fae Tripp on November 12, 1950. Paul spent all of his growing years in Toledo until his college years when his parents moved to Southern California. At Columbia Bible College from 1968-1972, (now Columbia International University) Paul majored in Bible and Christian Education. Although he had planned to be there for only two years and then to study journalis Paul was born in Toledo, Ohio to Bob and Fae Tripp on November 12, 1950. Paul spent all of his growing years in Toledo until his college years when his parents moved to Southern California. At Columbia Bible College from 1968-1972, (now Columbia International University) Paul majored in Bible and Christian Education. Although he had planned to be there for only two years and then to study journalism, Paul more and more felt like there was so much of the theology of Scripture that he did not understand, so he decided to go to seminary. Paul met Luella Jackson at College and they married in 1971. In 1971, Paul took his first pastoral position and has had a heart for the local church ever since. After college, Paul completed his Master of Divinity degree at the Reformed Episcopal Seminary (now known as Philadelphia Theological Seminary) in Philadelphia (1972-1975). It was during these days that Paul’s commitment to ministry solidified. After seminary, Paul was involved in planting a church in Scranton, Pennsylvania (1977-1987) where he also founded a Christian School. During the years in Scranton, Paul became involved in music, traveling with a band and writing worship songs. In Scranton, Paul became interested in biblical counseling and decided to enroll in the D.Min program in Biblical Counseling at Westminster Theological Seminary, Philadelphia. Paul then became a faculty member of the Christian Counseling and Education Foundation (CCEF) and a lecturer in biblical counseling at Westminster Theological Seminary, Philadelphia. Paul has also served as Visiting Professor at Southern Baptist Theological Seminary in Louisville, Kentucky. In 2009, Paul joined the faculty of Redeemer Seminary (daughter school of Westminster) in Dallas, Texas as Professor of Pastoral Life and Care. Beginning in June, 2006, Paul became the President of Paul Tripp Ministries, a non-profit organization, whose mission statement is "Connecting the transforming power of Jesus Christ to everyday life." In addition to his current role as President of Paul Tripp Ministries, on January 1, 2007, Paul also became part of the pastoral staff at Tenth Presbyterian Church in Philadelphia, PA where he preached every Sunday evening and lead the Ministry to Center City through March, 2011 when he resigned due to the expanding time commitments needed at Paul Tripp Ministries.